I have received several requests from readers of this blog for information on Dior Homme neckties. Ties are easy to fake and a bit hard to authenticate. The reason being that they are so simple. Many of the online auctions for Dior Homme ties have small blurry pictures with little detail. Of course, actually feeling the fabric and seeing the stitching in person is the best way to authenticate a tie, but there are some things you can watch out for. The first step is to check out the seller. Look at the other items he's selling and skim his feedback and look at the items he's sold. Even if you can't tell if the tie is fake he may have sold some other knockoff that is obviously fake (which would suggest, though not prove, that the tie is fake). The fake above looks like it is made out of an old couch. When buying Dior Homme online, keep the designer's aesthetic in mind. If it looks like a thoughtless 80's Christmas gift you received from your aunt, do you really want it? Speaking of the Dior Homme aesthetic; this beauty has a large gray "CD" logo printed on the front of the tie. In-your-face logos are not the brand's style (the women's line is another story). At first glance this tie looks like it may be an older piece from Christian Dior, circa their creatively-starved 70's and 80's years. However this gem has a fake Dior Homme label on it and was listed as a Dior Homme piece. The lining has a fake version of the "Dior" repeating pattern, with the letters spaced too far apart. The fabric content tags in Dior Homme ties are located in the fold, on the back of the skinny part of the tie. These tags are always silver with black stitched lettering, and the label is sewn folded in half. 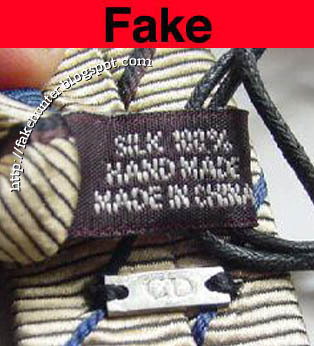 Above is an example of a fake fabric content tag. There are several things wrong with it. For one thing, the label is a blackish purple or something, not silver. Second, the lettering is too close together and stitched in white. Lastly, it reads "Made in China." Dior does not produce any clothing or accessories in China. To the best of my knowledge, Dior Homme makes all of its ties in Italy. In the end, ties are one thing I recommend buying direct from the store. They run around $170 (USD) and the authentic ones don't sell for much less on eBay. If you do choose to bid on one remember to ask for detailed photos if none are provided. Also, feel free to ask the seller where he purchased the tie from and if he guarantees authenticity. Keep in mind that the seller's response in no way guarantees authenticity. But, some sellers will try to warn off informed buyers with a line like "It looks authentic but I can't guarantee it," or "I'm selling it for a friend who says it is authentic." There are 2 Dior Homme "bee" ties on eBay, one of them ended and sold for around $82 US dollars very recently, and the other is still there to be sold. I know you don't know me, I am simply a girl (well, early 40s so whatever) from Montreal who has always wanted a Dior Homme "bee" necktie, but cannot afford to buy at the store itself. By the way, I think the DIOR store here in Montreal only sells women's stuff. Is there any way you could help tell me if the one still on eBay is authentic or not? I see some differences between the two ties, just hoping you could help me. So my email is rommel99@hotmail.com and if you reply to me that yes, you can help me, I will email you the photos of these 2 ties. I don't know how to add the photos on this site. Thank you.